Warning: a rise in the number of people unemployment does not necessarily mean an increase in the unemployment rate (as there may also be a rise in the numbers employed); and when there is a rise in the unemployment rate it does not mean an instant return to the 1980s. b) not expected to come close to the unemployment rate of 10 years ago (8%) or 12 years ago (12%) - see graph 3.5 in excel file from CSO. By the way, Ireland is now the only country out of the EU27 not publishing comparable consumer and business confidence data since April. I think it's a disgrace - yet there hasn't been any media coverage of this development. One other thing pointing to our mental recession is the fact that there appears to be no significant connection between falling house prices and consumer spending. 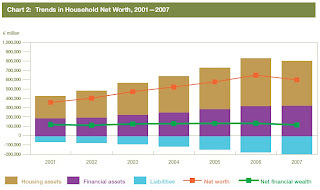 A fascinating paper on The Impact of Asset Price Trends on Irish Households (pdf) published today by the Central Bank does show that household net worth fell by 8% last year. Having risen by 82% in the preceding five years. See chart at top of post. Yet the Central Bank's analysis essentially shows that this has not had (and most likely will not have) any adverse impact on consumer spending. So here's a thought: might the suddenness of the slowdown in consumer spending be a precursor to a sharper than expected bounce back in early 2009? Once people get over the gloom of winter and the most depressing day of the year? We shall see. A welcome dose of reality and it is very worthwhile to point out the lack of comparable consumer data. If you bought O'Neill's argument, then look at this graph.